Hokkaido's spring festivals are centered around the abundance of flowers in full bloom found in every corner of the island: Sakura (cherry blossoms), azaleas, lilacs, tulips and pink moss phlox compete for attention between the months of April to June. ﻿While most people associate sakura hanami (viewing) parties with the main island of Honshu, Hokkaido can be a wonderful place to enjoy the most iconic of Japan's flower festivals. 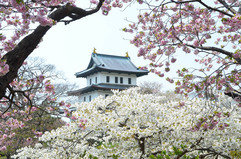 Matsumae, Hakodate, Sapporo and Asahikawa, just to name a few, all have gorgeous sakura hanami festivals, where you can picnic or BBQ alongside locals as they celebrate the joys of spring. Hanami parties are a great way to experience an unusual side of Japanese social mores. 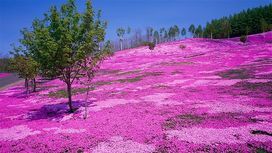 The thick carpets of pink moss phlox blossoms continue to be major draw cards in eastern Hokkaido. 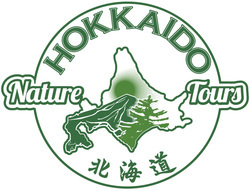 The two main venues are at Takinoue (north of Asahikawa) and Higashimokoto (near Shiretoko). The spectacle is impressive and worth driving to the remote locations to experience. For a smaller but more centrally-located moss phlox festival, visit Takino Suzuran Park just outside Sapporo. As the first flowers to bloom during Hokkaido's spring, azaleas herald the start of the season of flowers. Journey to the Tokachi region, near Obihiro, to witness the blooming of 16,000 azalea bushes at Honbetsu's festival. 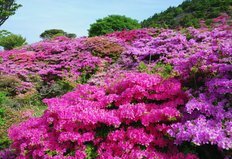 If that's not enough, go further east to "Azalea Mountain" in eastern Hokkaido for an incredible 70,000 azalea bushes, the largest collection in Japan. The base of Mt. Esan, an active volcano near Hakodate, is also a popular spot. ﻿Plum blossoms usually bloom shortly after the cherry blossoms, and Sapporo's Hiraoka Park Ume Festival is a great opportunity to view them. 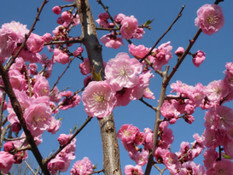 Hundreds of plum blossoms are spread across the park in their brilliant shades of pink. 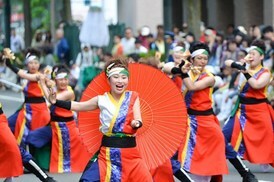 ﻿Come see Sapporo's streets come alive with this street dancing festival, which has been held annually since 1992. Currently, over 300 teams from all over Hokkaido take part in this 4 day dancing festival with elaborate routines, stunning costumes and perfect choreography. Grandiose varieties of tulips, stretched out in rows upon rows, are a wonderful spectacle for the eyes. 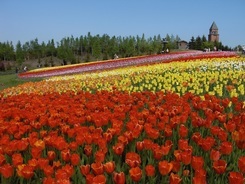 The explosion of tulips comes to life at two remarkable locations: Takino Suzuran Park (outside Sapporo); and Kamiyubetsu Tulip Park (near Abashiri). Every year many people turn out for the Spanish-style gourmet food festival in Hakodate called the Hakodate Seibu Chiku Bar-Gai Festival. Purchase a booklet of food tickets and choose your favorite dishes from the available restaurants. Street performances and the milling crowds add a nice atmosphere to this early spring festival. 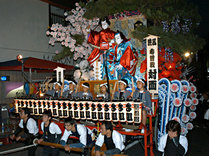 ﻿This century old Shinto festival reaches its climax on the final day, June 16th, when four mikoshi portable shrines and eight floats are paraded from Maruyama Park to central Sapporo. 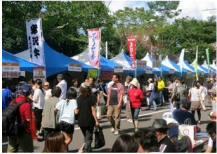 At Maruyama Shrine, there are many food vendor and festival tents that contribute to the celebratory atmosphere. 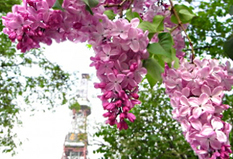 ﻿Started in 1959, the Sapporo Lilac Festival is eagerly awaited by Sapporo's residents. As the official tree of Sapporo, the lilac is held in high esteem. There are two locations where the more than 400 lilac trees can be observed: Odori Park and Kawashimo Park in Shiroishi-ku.